On 3rd December 2015, 27 participants drawn from various parts of the Central River Region North and South completed an entrepreneurship training organized under the Creating Opportunities for Rural Youth (CORY) Gambia project, coordinated by the Global Youth Innovation Network (GYIN) Gambia. The twelve days training meant to equip young men and women with entrepreneurship skills, focusing on project and enterprise development was held at the Forestry Camp Bantaba hall in Janjanbureh, the administrative capital of CRR. The training covered ten modules, with assignments completed by participants. Each participant is expected to train four youth in their respective regions. Five best participants from the training will serve as facilitators in the follow-up step down training to be organized by the project in the North Bank and Lower River regions. The CORY project is implemented in four African countries, namely: The Gambia, Nigeria, Benin and Cameroon. It targets to train 150 young people in The Gambia. 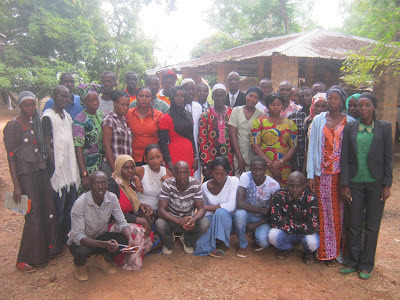 Similar training took place in Basse, for young people in Upper River Region (URR). In his closing remarks Malang Saibo Camara, CRR deputy governor said he is proud to be associated with such kind of training, and thank the Lord- Allah for accepting prayers to end the training peacefully and successfully. He added that he will be happy to convey the message to the CRR Governor. He indicated that “every father prays to have a successor, and we pray to have successful children. I am in position today, but I am looking forward for someone to succeed me in future,” he said. He added that The Gambia is blessed with young dynamic leader, who is keen to see the development of young people in the country. To participants, he made reference to the proverb that “you can only take horse to the river but you cannot force it to drink,” adding that in this case participants have demonstrated their desire to develop themselves, to enable them contribute towards the socio-economic development of the country, as evident by the outcome of the training. “You are the few selected out of thousands of young people in the region interested in the training,” he said; noting that trainers has done the right thing by giving them the required knowledge that enable them to develop themselves and share experiences with others in the community. Mr. Camara finally thanked Lord, and prays to Allah to help participants make good use of the knowledge gain from the training. Ebrima Ganno, executive director of the Gambia Women Finance Association (GAWFA), whose organisation is a key implementing partner in the project, served as lead facilitator for the 12 days training. Mr Ganno who also chaired both the opening and closing ceremonies of the training, said among others that the training was started with ‘Bismillahi Rahmaani Rahiim’ (in the name of God) and ended with ‘Alhamdullilaahi Rabil Haalamiina’ (Thanking Lord) for completing it peacefully. He expressed gratitude to the deputy Governor, who presided over both the opening and the closing ceremony. He said in the beginning of the workshop, participants and observed the rules created at the beginning of the training, leading to the smooth running of the training to the tail end, which manifests participants’ commitment and dedication to the training that brought them all together. “These are youth in your region, who are future leaders of tomorrow, trained to improve on their contribution to nation building. The participants were divided into three groups. Each group identified key problems affecting their people, and identified solutions to the problems. One of the groups identified smoke bonga as problem in the region, as they import it from Greater Banjul Areas, and before they reaches the region, they are not fresh in sales outlet, especially in Kuntaur and suburbs ,” said Mr Ganno. He therefore called on representative of group 1 to present their group work, to share part of their experiences during the training. Ms. Aminata Ndongo, a participant from Kuntaur on behalf of group 1, said the problem they identified during the training is inadequate Bonga and cat fish in their markets, adding that their group have interest to increase supply of fresh smoke Bonga and Cat fish at an affordable price. She said “during our group work we looked at setting up business, considering the market structure and personal drives, how to conduct market research; customer feedbacks, product development, distribution channels, branding checklist, revenue module assumption, cost analysis, resource mobilisation, and partnership building, among others. Ms. Amie Faye, GYIN Gambia rural regions coordinator on behalf the CORY Gambia project for her part thanked the deputy Governor for honouring their invitations to grace the occasion. Vote of thanks was given by Mr. Sakou Jatta, a participant from Wassu, who commended the trainers for sharing their knowledge and experiences in helping youth adopt to skills that help them contribute to personal development and towards socio-economic development of the country. The Rural Entrepreneurship Venture Creation Experimental Learning (REVCEL) training under implemented by the Cory Gambia project on 22 November 2015, the second badge of young people drawn from various parts of CRR North and South at the Forestry Park aimed to equip them with entrepreneurship skills. Welcoming participants during pre-training orientation, project coordinator - Mamadou Edrisa Njie presented on the bylaws governing the training, before proceeding to Basse to facilitate similar training simultaneously held for 27 young people in Upper River Region (URR). “CORY Gambia Project REVCEL training is jointly implemented through collaboration with The Gambia Women’s Finance Association (GAWFA), Village Savings and Credit Associations (V-Apex) and Jarumeh Koto Youth Development Association, among others. The goal of the CORY project is to enable young rural women and men to create sustainable farm and non-farm businesses, by building their entrepreneurial capacities for enhanced peer learning and their access to complementary business development services. The project duration is three years from 2014 to 2017. “The project, which is supported by IFAD, will build on IFAD’s ongoing and pipeline rural-youth projects in the targeted four countries, namely: The Gambia, Benin, Nigeria and Cameroun.